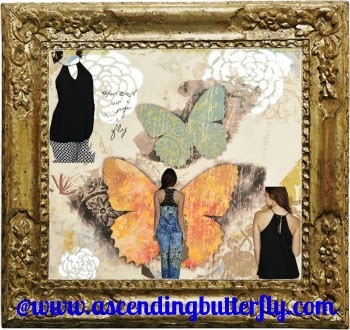 Ascending Butterfly: Summer is certainly 'in bloom' with @InBloomLingerie - See what's new and enter to win a $50 Gift Card too! Summer is certainly 'in bloom' with @InBloomLingerie - See what's new and enter to win a $50 Gift Card too! Many of you know it has been 'love at first wear' ever since I discovered In Bloom by Jonquil, they are best known for their beautiful Bridal lingerie and peignor sets. If you watch the television series Hot in Cleveland, the character Joy Scroggs played by actress Jane Leeves happens to wear In Bloom Pajamas quite often. Her character Joy often wears many of the same in Bloom pieces I own. And my fellow 'truebies' aka fans of HBO television series True Blood will have also seen in Bloom being worn by one of the characters on the show as well! Television Wardrobe Stylist's have discerning taste, they not only have to get a feel for the character to nail their style, but I'm sure how well the garments actually wear is an important factor on the set as well. I'm more in to Quality than Quantity myself and yes that includes my PJ's, if they are comfortable but don't wear well, what's the point? For me my in Bloom Pajama sets have been the perfect marriage of form and function, because they have all worn incredibly well, they wash well, I haven't experienced the dreaded pillage on the PJ pants, and they are super comfortable, and many of the loungewear pieces could pass for beach wear and 'outside' wear without anyone even thinking they were PJ's (always a plus in my book). When I think of PJ's and Loungwear I think of my 'chillax' time and there is nothing better than a good book to go with new PJ's right? Press on the banner below to do just that! I don't have copies I can offer you yet Butterflies, but In Bloom is more than great PJ's, it's a BOOK too! (Press on the banner above to purchase it directly at Amazon at a great price!) 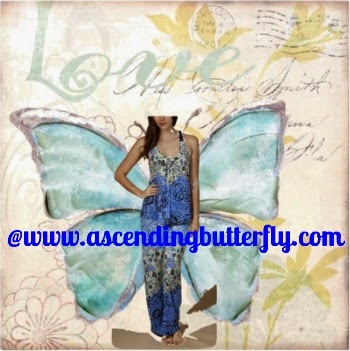 I'm working with the author to get hard copies of the book available for a giveaway on Ascending Butterfly soon! On a Polyvore roll! This Polyvore board showcases the Blue Grass set from the back (look at the detail on the top with the cute lace racerback!) and I also featured the 'Riviera Tank' in Black which in my opinion you could even wear out over white jeans, such a cute 'right now' tank top! One Lucky Butterfly has a shot at a $50 Gift Card to In Bloom. Use the Rafflecopter Widget/Link below to enter. As always our 'main entry' is easy peasy, and once you do the main entry you unlock a ton of fun extra credit entries. Most often loungewear items are sold individually on in Bloom so I totally appreciated that the Blue Grass Pajama Set is sold as a pair. The Riviera Tank is absolutely gorgeous and it pairs up with all the bottoms perfectly and in my opinion you can totally get away with wearing it out as a top with jeans too. These were all definitely a hit for me! FTC Disclosure: In Bloom by Jonquil provided Ascending Butterfly with product for Editorial Consideration, all opinions are 100% my own! I am disclosing this in accordance with the Federal Trade Commission 16 CFR, Part 255 - Guides Concerning the use of endorsements and testimonials in advertising, you may check our Giveaway and Disclosure Page for additional information regarding Ascending Butterfly Disclosure. There is an affiliate link in this post. That sounds like a great book! I would love to curl up on the couch and read it. I love the Blue Grass pajama i would wear that for sure.Great giveaway shame i am in the UK. @Kay Adeola - No worries, we work with international brands too, so when a giveaway is open for international entries we make sure they are clearly labelled as such so everyone knows. Hopefully we have something fun for our international readers soon! I like those racer back looks. It's so comfortable, and I hate sleeves when I sleep. @Lindsey Paris - I loved the lace detail on the racerback on this set, they always offer unique detailing that makes each set really stand out! I am all about jammies!! I .. sadly.. too often live and lounge in them since I work at home. Sounds like a great brand! Thanks for sharing Miss Tracy! Book sounds great. But those PJs looks like something I need to take a look at. I love comfy PJs! @Chrystal I love in Bloom PJ's and very highly recommend them! The In Bloom items are so pretty! They look so comfortable too. I love the cami/short sets. They are cute but also great for bedtime. I'll have to check out the book too. Thanks for the heads-up on it. I love to read! @Stefany T - They are super comfortable! I hope to be able to offer a giveaway of the book very soon! Really is an interesting book. I need to check this out. @debdenny I can't wait to read it! I LOVE my yoga pants when I am at home. Heavens, I have to move around sooo much with three little kids, that yoga pants are a must! I have to go and check out that book too. Sounds really interesting! I have the foulard twin pant,tank and robe and I truly love them .They look and feel and wash well !!! I'll be a reg. @Big Happy Buddha - What a great set! Usually I just wear shorts and a tee (love the buttery soft American Apparel) to bed, but I'd love some actual jammies! :) Looks like a fun giveaway! @Kayla in Bloom has some super cute cami sets that I'm sure you will love! being in my pj's is a great day. When I'm in my pj's' and get to read a book that is the BEST day ever. LOL Looks like a great book for me. @Dina - I agree about that combo being the best day ever! I even like reading during a nice warm bath! How interesting, a book AND lounge wear line. I'm going to check out their pieces. @Demetra - Let us know what pieces you pick up! @Melinda - Everytime I get a pretty new set, I rid my drawer of something old. Gives me motivation to change everything over and see nothing but pretty matching sets! I'd probably go for loungewear. It looks SO comfy, I want a set right now! @Savory Experiments - Their loungewear is definitely my favorite! I have some 'frillier' pieces now too, but the PJ sets are still my favorite go to's in all seasons! Chillax time would be so nice. It's been a long time. @rosey - You just have to carve it out for yourself or it won't happen. Make it the same priority you would paying a bill and schedule it regularly! Looks like some really cute pajamas! I love pajama sets. I watch Hot in Cleveland. I will have to watch specifically for the pajamas! @Jenn - Jane Leeves character, Joy wears them the most, that blue peacock looking designed robe that Joy wears often is one of my personal favorites from in Bloom. I love the whole set, but I do love that robe! I notice they put it on her often. I smile each time! I love comfy pajamas and am always on the lookout for better ones. Sounds like an interesting book. @Virginia Same here! When it comes to PJ's much like handbags and shoes I can't seem to have too many or enough! I hope to have copies of the book to host a giveaway soon. I'm waiting on print copies I don't like reading digital copies, I'm still very much a paper girl! But for those who don't mind reading it in digital format I provide a link to get it at Amazon at a really great price! I love the Jammie and recognized them from True Blood! So cool! @Sippy Cup Mom - I get excited when I see them on True Blood and Hot in Cleveland too! In Bloom has some beautiful lingerie! I would love to be able to get some of those comfy pajamas sometime! @Carly - Always check the 'sales' section of in Bloom's site, there are always great pieces on sale! I love the Flower Child Cami/Short, it looks really comfy. I've been looking for new summer reads! Thanks for the great giveaway! @Christie C - We hope to have copies of the book to host a giveaway soon! I am shooting to have it be the book and the PJ's together next time around! I love a nice set of pajamas! Of course, lingerie is great too - you just can't walk around the house in it with kids! LOL! True Blood fan here. How cool to be able to get those pajamas! Those Foulard Twin Pants look amazingly comfortable to me! I have never shop at bloom but heard its a great place. I must check it out! I REALLY like that pajama set! Looks really comfy and great Summer colors! I have never heard of this company before. I really like that their line is not tacky! I love the Garden Party Chemise! I must say I'm really intrigued with that story. I think I'd enjoy that a lot! I love chillax time, too! I would live in my pajamas if I could. I, honestly, have more pjs than actual dress pants :) They're just so cute and comfy how can we resist buying more and more of them, right?! That's an awesome PJ set! Thanks for sharing (fingers crossed for the giveaway). I'm not much of a book reader.. but I do love me some jammies-time! I love the blue grass set, loving the detail in the back. I cannot find enough racer back styes for myself. There's nothing better than curling up on the sofa with a good book, tea, and comfy pajamas. In Bloom sound like they would be the perfect pajamas for that. I love the chantilly satin nightgown. Very pretty. Love the jammies! I would never get out of them LOL! I love the MINDY PAISLEY TANK/PANT PJ SET. The colors and pattern are beautiful. It looks comfortable but still stylish. This is such a change from frumpy PJs! i love the bombay paisley set ! :) so cute and pretty! The Riviera Maxi Gown is beautiful! I love the Chantilly Chemise! I love the Ombre Cascade Chemise. I love the Lace Cascade Ramp! The Isabel Robe is my favorite style.